By JohnnyOnTheSpot, January 10, 2011 in Let It All Hang Out! 2010 was when cool base jerseys came out. No, it's older than that. It does go back to 2006 because I know, at the very least, the Blue Jays wore it that year. I'm just not too sure about other teams. I think...THINK they wore standard doubleknit. All the game-worn ones I'm seeing just researching it are doubleknit BUT the thing about the CoolBase is that it was and still is a player option. I'd say no to it but I can't be positive about that. Check out ptfsports on eBay. He has a TON of Majestic jerseys for most teams and they're usually dirt cheap because they all start at $24.99. I knew all teams switched to cool base format in 2010. I didnt realize that others wore them. PTF has those older majestics they arent cool base. They were what was worn before 2010. 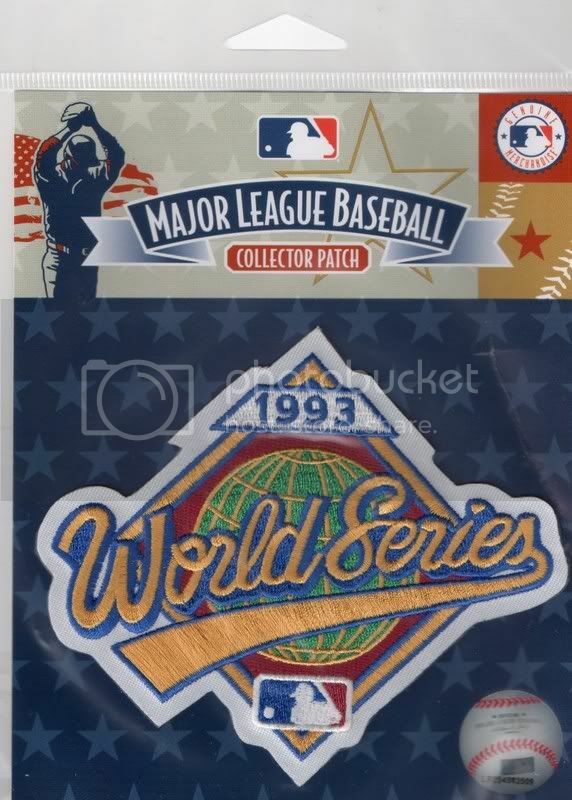 Can anyone help me find an authentic Blue Jays jersey from the world series wins back in the early 90's. There's usually a few one eBay but it depends on your size. Some of them can be awfully small. what one is the legit one? the rawlings or the Russel athletics? Well, that's a little bit of an issue with those. The Leafs wore Wilson jerseys on the field BUT the retail ones were either Rawlings until 1991 or Russell Athletic from 1992. If you were to do a World Series one though, you should go with the Russell. Show me which ones you're looking at and I'll tell you if it's good or not. is this the correct style for that era? Yeah, that's good. The only difference is the manufacturer. That jock tag was used in 1990 and 1991. But, for all intents and purposes, that's the same style. Thanks for the help Brilliant! I made a bid on e bay for an Angels jersey from that seller you mentioned. I'm going to have to do a bit more research but probably end up getting a doubleknit Erstad jersey just to be on the safe side. Thanks. Sadly I lost out on two auctions, so Im going the buy it now route. So I was wondering this jersey was legit as I have had a bad day with ebay and wanted to make sure. That one looks good. He probably got it from PTF and is reselling it at a bit more profit. Just so you know though, if you're looking for an Angels jersey from the early 2000's, it should be a Rawlings jersey. I think they wore Rawlings until all teams switched to Majestic in 2005. Is the jock tag on the cool base jerseys screen printed? Just got one in and thought it was weird to be screen printed on there. Yeah it is. I never understood the point of it being like that but whatever. Thanks. It looks weird but as long as its what it has to look like then o well. I ordered a jersey and when I got it I started to look at it. I noticed that some of the z stitching on the logo was off but I figured that no one would be that close to me to notice it. Then I got to see the final letter in the logo and noticed that the stitching went a little way off from where it has to be. It takes a bit of a dip on the last letter's stitching. I was wondering if I should exchange the jersey or if I'm just too picky? Are any of these 3 good? If so, which? Thanks for the assistance! This just in!.. On the way over to mike for a "Carter" Job. 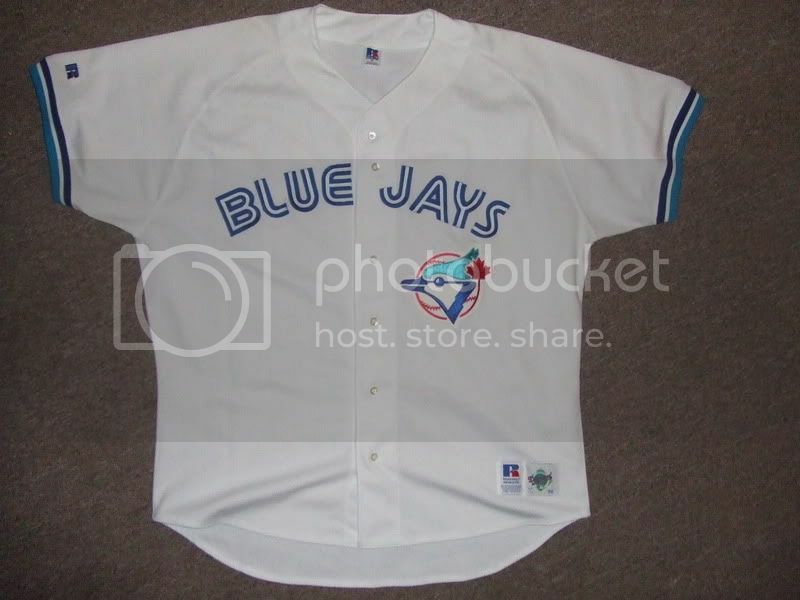 The 1993 Jays jersey. Size 52.
and the Legit World Series patch too boot. in case you might forget where you have seen this jersey before please view below link. always liked the old style blue jays jerseys. Nice pickup. Has anyone ever had an MLB jersey customized by Major League Lettering? I'm thinking about buying a jersey and having it customized.